Pure New Wool is the key ingredient in Bellbridge carpets. Our sheep graze in a pristine natural environment and impose a minimum amount of environmental impact. Wool is a naturally renewable resource that biodegrades easily. Most of our products contain New Zealand wool, which is desired for its superior strength, purity, and consistency. 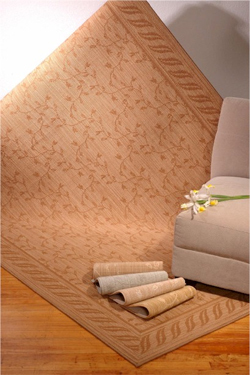 Bellbridge Wool Carpets are also good for the indoor environment. Wool flooring absorbs and neutralizes common indoor contaminants such as formaldehyde, nitrogen dioxide, and sulfur dioxide, helping to purify the indoor environment. More importantly, wool fibers will not re-emit these pollutants. Quality is a hallmark of Bellbridge. We apply our rigorous standards at each step of the manufacturing process by creating the right yarn and specification to construct carpet that delivers both end use performance and aesthetic appeal. Bellbridge provides the sales and interior design professional with an array colors, designs, and textures that reflect the current and future trends in interior design. Our product range is designed to offer styles that compliment a wide range of environments. Whether your decor is English Traditional or Country French, Casual or Contemporary, Residential or Corporate - there is a Bellbridge Carpet that will enhance the interior in which it is installed. While we strive to deliver the latest fashion, we maintain our design integrity. Our products reflect our passion to create clean classic designs that will maintain their beauty over the carpet's long life. Bellbridge is as committed to delivering quality service as much as we are to producing quality wool flooring products. Bellbridge considers its relationship with our salespeople, our customers and our customer's clients as a vital on-going partnership. Our Service Staff strive to provide responsive, knowledgeable, caring service through out the selection, sales, delivery, installation and use cycle.